PATRICK RADDEN KEEFE is a staff writer at The New Yorker, an Eric and Wendy Schmidt Fellow at the New America Foundation and the author of The Snakehead and Chatter. His work has also appeared in The New York Times Magazine, Slate, New York, and The New York Review of Books, among others and he is a frequent commentator on NPR, the BBC, and MSNBC. Patrick received the 2014 National Magazine Award for Feature Writing, for his story "A Loaded Gun," was a finalist for the National Magazine Award for Reporting in 2015 and 2016, and is also the recipient of a Guggenheim Fellowship. "Resolutely humane. . .Say Nothing [has an] exacting and terrifying lucidity. . .meticulously reported. . .Keefe's narrative is an architectural feat, expertly constructed out of complex and contentious material, arranged and balanced just so. . .an absorbing drama." "Say Nothing has lots of the qualities of good fiction. . . Keefe is a terrific storyteller. . .He brings his characters to real life. The book is cleverly structured. We follow people--victim, perpetrator, back to victim--leave them, forget about them, rejoin them decades later. It can be read as a detective story. . .What Keefe captures best, though, is the tragedy, the damage and waste, and the idea of moral injury. . .Say Nothing is an excellent account of the Troubles. "An exceptional new book. . .explores this brittle landscape [of Northern Ireland] to devastating effect. . .Fierce reporting. . . It is a dizzying panorama, yet Mr. Keefe presents it with clarity." 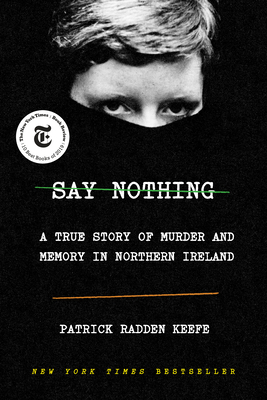 "Say Nothing investigates the mystery of a missing mother and reveals a still-raw violent past. . .The book often reads like a novel, but as anyone familiar with his work for The New Yorker can attest, Keefe is an obsessive reporter and researcher, a master of narrative nonfiction. . .An incredible story." "Haunting. . .As a cautionary tale, Say Nothing speaks volumes — about the zealotry of youth, the long-term consequences of violence and the politics of forgetting." "As the narrator of a whodunit. . .[Keefe] excels, exposing the past, layer by layer, like the slow peel of a rotten onion, as he works to answer a question that the British government, the Northern Irish police and the McConville family has been seeking the answer to for nearly 50 years. . .Say Nothing is a reminder of Northern Ireland's ongoing trauma. And with Brexit looming, it's a timely warning that it doesn't take much to open old wounds in Ireland, and make them fresh once more." "Meticulously reported, exquisitely written, and grippingly told, Say Nothing is a work of revelation. Keefe not only peels back, layer by layer, the truth behind one of the most important and mysterious crimes of a terrible conflict; he also excavates the history of the Troubles, and illuminates its repercussions to this day." "Patrick Radden Keefe's gripping account of the Troubles is equal parts true-crime, history, and tragedy. Keefe's incisive reporting reveals the hidden costs of the Troubles, illuminating both the terrible toll of the conflict, and how it continues to reverberate today. A must read." "Patrick Radden Keefe has the rare ability to convey an intimate story that powerfully illuminates a much larger one. Combining the skills of an investigative journalist with the storytelling power of a suspense novelist, Keefe brilliantly represents the menace and intrigue that devastated Belfast during The Troubles, and shows the course of ordinary lives headed toward inevitable and awful collision. By turns gripping and profoundly revelatory, Say Nothing shines a brighter light on Northern Ireland's tragic past than any history book." "[Keefe] incorporates a real-life whodunit into a moving, accessible account of the violence that has afflicted Northern Ireland... Tinged with immense sadness, this work never loses sight of the humanity of even those who committed horrible acts in support of what they believed in." "A searing reflection on the Troubles and their aftermath... Masterly."